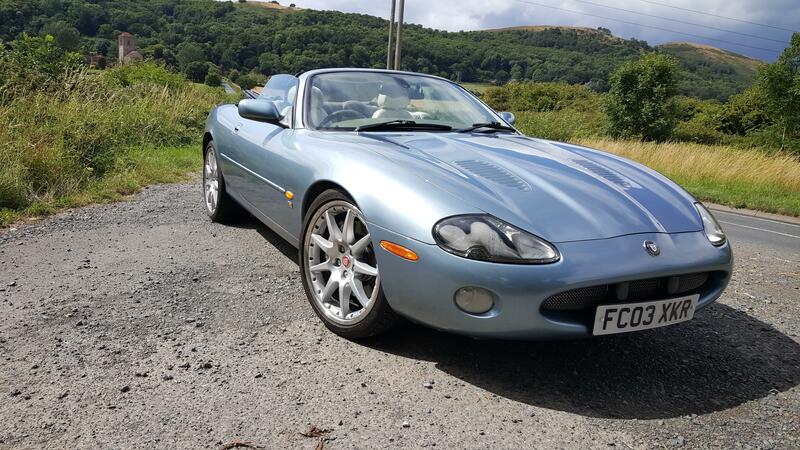 Needing your thoughts and ideas on my idea to buy an XK8 or R. I am thinking of hanging on to it until its value increases as it looks like people are saying this may be a future classic. Apart from that it looks like a great toy so even if it doesn't invest well it'll be good fun at least. So...Should it be an XK8 or an XKR, should it be a convertible or hard top? I bought my XK8 a few years ago from a friend who upgraded to an XKR. I prefer the looks and the analogue instruments of the XK8 but there is no doubt that the XKR has a bit of an edge in performance. I also like the " flappy paddles " of the XKR but whether or not I would use these on a regular basis is another matter, the older I get the lazier I become ! Certainly prefer a hard-top. A soft-top sounds appealing but I've owned convertibles in the past and found that once the novelty wears off the roof tends to stay closed for most of the time. As a hard-top provides more comfort, despite an occasional urge to go for a convertible, I'd resist this and stick with a solid tin roof ! So far me it's all down to personal preference. I'm sure that you are aware of the potential costs of running either of these cars. The XKR, which is 10 years younger than my XK8, doesn't seem to be any better, or worse, for reliability and the odd faults and in fact seems worse for underbody corrosion issues than my XK8. Thanks for those thoughts, good to hear from those who have an XK8. I think the R because it is a true sports car, there are less supercharged cars or there and my personal thoughts is that it looks just a little better. Not to worried about the cost of running it, any old car will have its upkeep faults, but I'm sure if kept in check these costs can be minimised. Not thought about the dials that much, I'll have to have a look at that. Whatever you decide on enjoy the search - hope you find what you want. You have the right idea going for the XKR. It has the most options, not to mention the speed aspect. When I first looked I did not want an XKR. But I am SO glad I went for the option. When you get used to driving these cars its fun sometimes to treat yourself to a bit of short speed. Its as controlled as an XK8 so dont worry about putting your foot on the accelerator and smashing into the car in front. Hi Fussy Frank!!!! I think I've decided on the R there's a few nice ones around on auto trader and eBay. My issue at the minute is storage, I need a place to keep it as it won't be used daily, I plan to keep it for an investment so need a nice dry secure home. I will of course use it regularly but I want to keep it as fresh as I can. Why not join the other forum? Takes seconds then you can PM him? If you prefer I could give you my email address. Send me your phone email etc and I will pass on your details to Nevile.